Certain publicly bid and awarded contracts have to be approved by the New York Office of the State Comptroller (OCS). 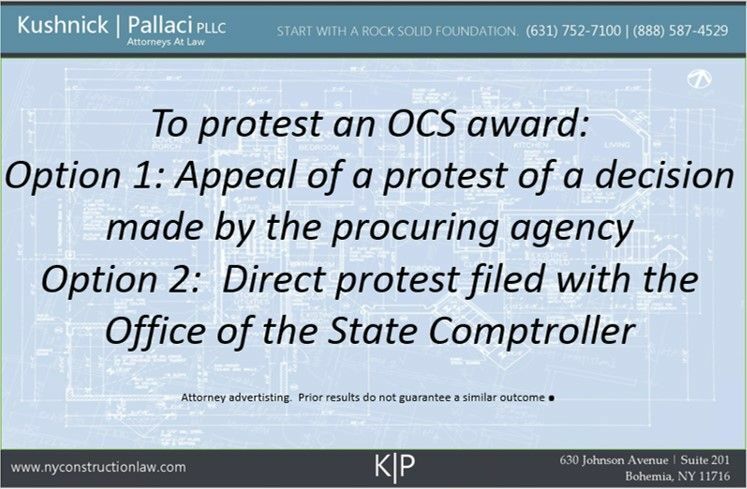 In those instances where you want to protest an OCS award, the Comptroller’s office has established procedures to be followed. 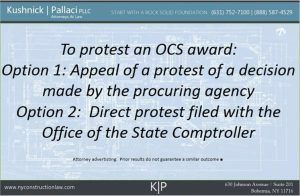 Generally, there are two types of protests that you can file with the Comptroller when you want to protest an OCS award. One is an appeal of a protest of a decision made by the procuring agency. The other is a direct protest filed with the Comptroller’s office. Any interested party (such as another contractor that bid on the contract and lost) may appeal the contract award and the agency’s determination by filing a written protest with the Comptroller within ten (10) business days of its receipt of the agency protest determination. While the Comptroller can waive the ten (10) day requirement, we never suggest being a test case. The written appeal must be served on the contracting agency, the successful bidder and any other party that participated in the protest to the agency. A direct appeal to the Comptroller is permitted if (1) the contracting agency does not have a written protest procedure; (2) the contracting agency has not provided notice of its protest procedure in the solicitation document; or (3) the facts that give rise to the protest are not known to, and could not have been reasonably known to, an interested party prior to the date by which a protest was required to be filed with the contracting agency. The direct protest to the Comptroller, like the agency protest, must be in writing and must be filed within ten (10) days of notice of the contract award. Again, while the Comptroller can waive the notice requirement, it is not a good idea to be a test case. In addition, if the appealing party is not provided with notice of the contract award then it may file a protest with the Comptroller at any time after the contract is awarded and prior to the Comptroller’s approval of the contract. To read the Comptroller’s detailed procedures you can click here. This entry was posted in Public Construction Contracts and tagged Bid Protest, Public Construction Contract by VTP. Bookmark the permalink.